Long time lurker, semi-often commenter, first time posting a fresh thread here (as far as I can remember). Whenever I comment on a post and mention that I’m a marketer and have consulting clients, I *always* get asked “how did you get/do you get clients?” I see this here, on /r/financialindependence, on forums, and different sites. It’s always the same question. 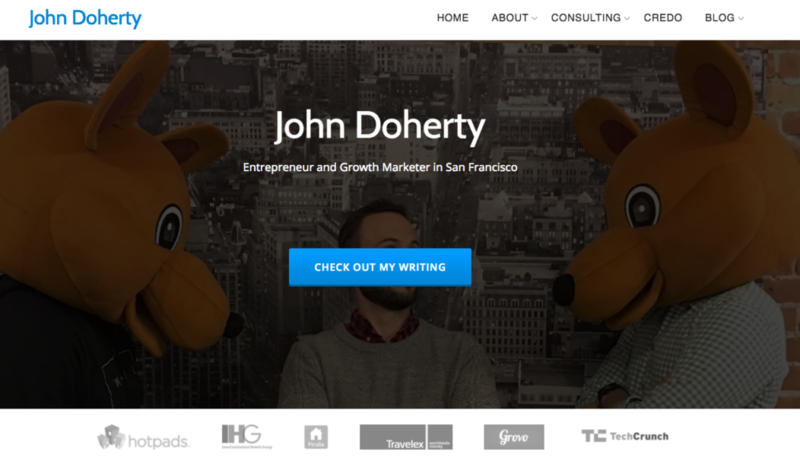 I’ve been in this game long enough (personal site: johnfdoherty.com and business site: getcredo.com) to know that some people are just looking for a silver bullet to “getting rich with consulting” (reality – consulting is hard and yes you can make great money, but you still have cash flow issues more often than working a real job) while others are genuinely interested and ready to put in the work. Those ready to put in the work are a smaller crowd to be sure, and most people who end up successfully freelancing are already doing work on the side at their day job and once their freelance income surpasses their regular income they go out on their own (and hopefully never look back). Instead of continuing to write out a short and somewhat annoyed answer every time, I figured I’d write this fuller guide to how I got and get clients, which will then inspire you to put some of these into practice. Some of what I’ve written here I recognize was built into my upbringing (such as starting to work young), but a lot of it you can go ahead and implement yourself. Remember, the best time to plant a tree is yesterday. The second best time is today. My first job was at 12 years old cleaning horse stalls. I got paid $1 per stall that I cleaned, and had anywhere from 8-10 to clean in a four hour shift. I pretty quickly realized, even at that age, that if I was able to get all of my work done in 2 hours I’d get paid the same amount and then could go do something I loved, at that point riding horses. I figured out that I needed to have a stall done every 12 minutes, without quality lagging, to be able to move on to the next one in time to hit my goal of four per hour. I did this, and it taught me quite a few lessons about time management, the value of time, and working towards what you want (aka setting goals). I’m not sure kids these days are allowed to start working at 12, but when I see a lemonade entrepreneur or Girl Scout selling cookies I always smile because they are learning lessons that will make them successful in life – specifically that sometimes you have to go find your customers. They don’t come to you magically. There are probably a few in there that I am missing. My father told me when I was young that I should always have a skill I could fall back on to make money if I needed to. Somehow I ended up with the same physical skill as him – painter – and got my very first taste of entrepreneurship one summer when I filled 6 weeks between school and another job by doing what I now like to call “freelance painting”. That job specifically taught me about the hustle required to go find clients. I also used my network (family/friends/church) to get these, which is a valuable lesson for all of you starting out – use your network and ask them if they need (service you offer) or if they anyone who does. Every job you have teaches you skills that you can use later in life, if you choose to look at it that way. Every single job I’ve had has helped me with getting consulting clients and software customers now as a self-employed individual. My customer support job taught me SQL and other technical skills. It also taught me how to manage clients and keep them happy. My gift shop job taught me the value of processes to keep things where they need to be. My university education taught me the beginning of web development that I’ve now used to build custom software. Every job I’ve had, I used to get myself to the next job. If you can string together the skills you’ve learned, eventually you’ll realize that you are capable of a lot even though you still have a lot to learn and will be learning for the rest of your life. The “getting consulting clients” tip here is this: use your past experience to get what you want next. If you’ve worked with a lot of SMBs, then say that when you’re speaking with an SMB about their needs. I’ve worked with a lot of marketplaces, so now I mostly specialize in that and say it on my website and profiles. Business is all about who you know. In my customer support job straight out of college in 2008-2009, I learned the value of in-person time with clients. This is why I always travel to visit my clients if they’re a long term client – you get more done in person in a day than you do in two weeks remotely in my experience. For the last six years, I’ve prioritized going to conferences and meeting people in person. Meetup two hours away that has a bunch of people I want to meet? I’ll drive there. Beers with a bunch of people in my city? There. Fly across the country to go to the biggest conference with a free ticket (from my company) but don’t have housing covered? Figure out how you do that. Once you’ve started connecting with people in person, then you can continue to build those friendships over time. People do business with their friends. If you’re comfortable speaking publicly, then find local events to speak at first. You’ll probably have to pitch and that’s ok. Get yourself on stage and deliver value. Then use that experience to get more speaking gigs. I know many marketers who have filled their pipeline by speaking. I also know many who are petrified of public speaking, so keep reading. I’ve been writing since I was very young. I started writing my first novel when I was 12 or 13, basically a twist on Lord Of The Flies. I also started my first blog around the age of 16 or 17 and haven’t looked back. I’ve gone from Blogspot to Tumblr to Joomla to WordPress, but all along the way I’ve kept writing and sharing. 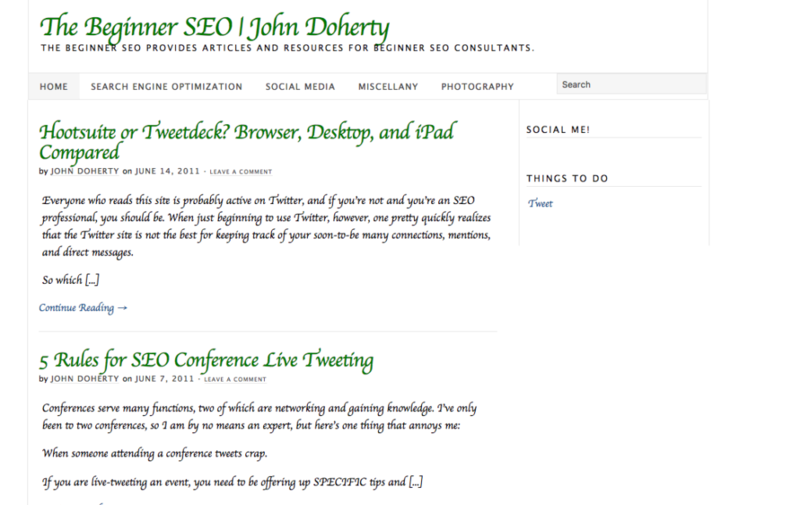 The single best thing I did for my career was launching this site, johnfdoherty.com, in February 2011. For the next 3 years, I published a new article every Tuesday and Thursday, teaching things I was learning. Sometimes I gave away templates for link building or prospecting, or I showed how to audit a site, or I zinged the marketing industry to tell them to stop talking about themselves. I’ve done videos, I’ve written short posts, I’ve gone viral on Hacker News. Some posts hit, others flopped. And that’s fine. By blogging consistently and seeking to teach others how I do what I do, I established myself as an authority in the SEO and digital marketing space. The most successful consultants are those who are able to promote themselves in some way and show that they are really good at what they do. This point is mentioned above, but I think it merits its own section here. If you want to establish yourself as an authority, you need to have your own website “home” online. I don’t care if it’s a one-page site or a full fledged blog – you need to have a place where potential clients can learn more about you and then contact you. Everything is constantly changing online. 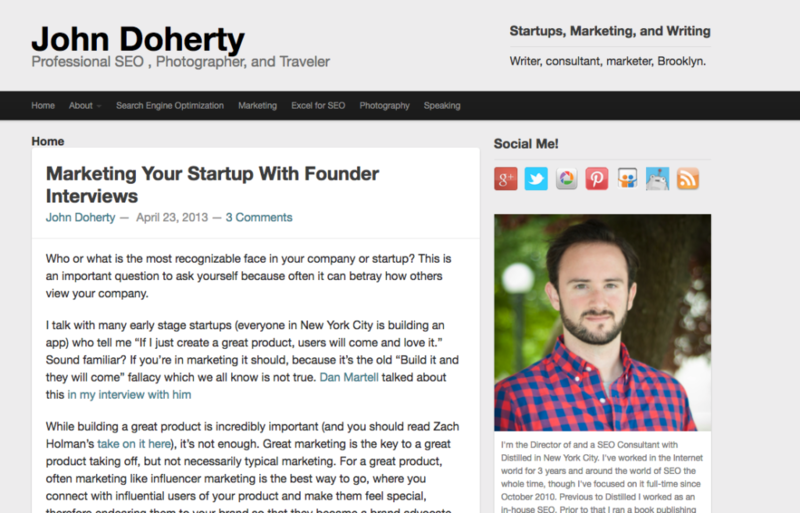 Your goal should be to rank for your own name, show your work, and show how to contact you. I joined Twitter in 2008 but didn’t really start using it until I got my first iPad for Christmas in 2010. From then on, I was hooked. I was able to connect with amazing people across the world and across my industry. Over the years I’ve used Twitter in many different ways, from live tweeting conferences (and then doing conference recaps) to primarily as a way to blast content, to coming back to a mix of connecting with people and sharing interesting links. Twitter is how I have met most of my really close friends and people that I have done a lot of business with. Yes, I have a decent sized following now but that has been built organically over the years as I’ve sought to simply add value to the Internet. All of the above are the things I’ve done to build my name so that people come to me (I do zero cold outreach for clients, and never have), and so that I only attract the right clients. I don’t want to do SEO for $1000 a month – I want to do executive-level strategy for many more thousands a month. But if you’re not there yet, and you don’t love speaking or you’re not a good writer, what can you do to get some clients? I’ve recently learned a lot about building a business outside of the typical inbound channels. While I definitely do those, and they work over the long term, if you’re looking for quicker growth you’re going to need to supplement SEO/content/links/etc with some other strategies. The biggest one I have seen work for people starting off in consulting is partnerships – make friends with other consultants who might have too much work or who might get leads for services that they don’t offer, then partner with them to work on clients together or send them back and forth. After all, if you’ve never consulted before you might learn that you hate the client-facing parts of consulting and just want to do the work. In this case, being a solo consultant will not work well for you long term. But if you are partnered with others, they can potentially do the client-facing stuff and you can take more of the services side of the client. I’d be remiss not to mention using platforms like my own, Credo, or other niche-focused ones for design or development. I think of places like Codeable for WordPress developers, the Shopify Experts list for Shopify agencies, and even places like UpWork can be a good place to begin getting new clients. I’ve always hated on cold outreach as it felt really spammy, but I’ve recently come around to seeing how it can be very valuable for businesses, especially those first getting started. Use a tool like QuickMail.io to automate followups if you don’t receive a reply. Carefully curate your list and have a custom pitch for each one with a specific ask. Have case studies prepared for the results you’ve gotten for clients. 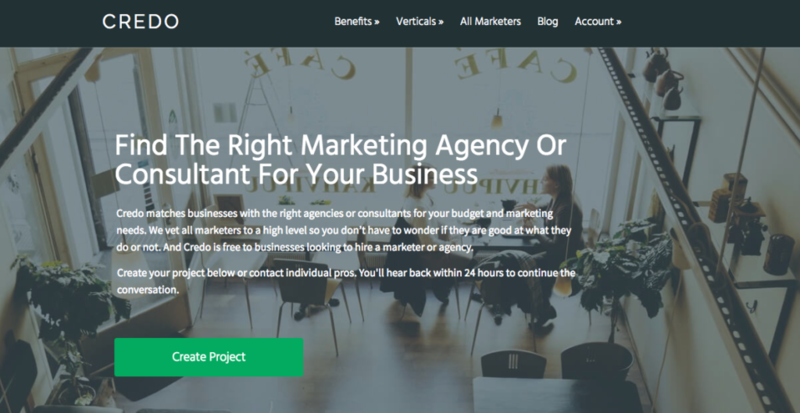 My guess is that cold outreach like this will have a low hit rate converting into clients, but it is a great way to get your foot in the door and then use that experience to get more clients via the other means I’ve mentioned in this article. Many consultants/agencies got their start going door to door. A tool that I see many people using these days to get new customers is Facebook Ads. While most that I see are marketers selling their marketing services to other marketers, I’d be willing to bet that with the right custom audience and a closely controlled geo-targeted area, you could get quite a few inquiries for your consulting work through Facebook Ads. Facebook Ads are also still quite cheap, basically AdWords back in the late 2000s. Worth a shot at least. How about you? Help out the new consultants in the industry and give some advice on getting new clients! I like it. Carefully curate your list and have a custom pitch for each one with a specific ask.